Inflammation is one of the body’s primary defense mechanisms. When something harmful happens to the body, its natural response is to remove it as quickly as possible. As a result, we see an increase in blood flow throughout the body, in which it flushes the targeted area with antibodies and specific hormones as means to breakdown and remove whatever is causing harm. Once the harmful irritant has been removed, the immune response will cease and the body can prepare for recovery. This process essentially describes inflammation. Interestingly, while physical stress (such as injury, or the entry of pathogens into the body) can cause an inflammatory response, there is recent research to suggest that both emotional and mental stress can as well – which can have a number of negative repercussions. You see, in the short term, inflammation can be beneficial. It allows the immediate removal of harmful matter, while also flushing the body with nutrients that are essential to promoting recovery. Unfortunately, if prolonged, the inflammatory processes will place a large amount of physical stress on the body. If left unchanged, this can lead to a host of health issues, including an increased risk of heart disease, diabetes, and cancer, in conjunction with inhibited mental function and associated feelings of depression and lethargy. In short: Long term increased inflammation is not good. Now one key recommendation to reduce inflammation throughout the body is to limit your exposure to stress. While this does sound white good in theory, it may be somewhat unrealistic in certain scenarios – particularly when we are dealing with emotional and mental stressors (such as work related stress, or financial stress). But fortunately for us there are a number of specific supplements that have been shown to reduce inflammation throughout the body, causing large improvements in both physical and cognitive health and function. What Do Inflammation Fighting Supplements Do? In short, inflammation fighting supplements do just that – fight inflammation. They interact with the body at a cellular level, reducing the secretion of compounds known as pro-inflammatory cytokines (compounds that cause inflammation), while also inhibiting the action of pro-inflammatory hormones (hormones that cause inflammation). Through these interactions, key supplements cause large reductions in inflammation throughout the body, which leads to a significant increase in health. As an added bonus, these same compounds are known to promote a healing process that can reverse the negative impact of prolonged inflammation throughout the body. What Should I Look for in an Inflammation Supplement? Fish Oil: provides the body with two key types of omega-3 fatty acids known as DHS and EPA. These particular fatty acids have been shown to cause large reductions in the secretion of inflammatory cytokines, while reducing the harmful inflammation associated with an increased risk cardiovascular disease, diabetes, cancer, among a host of other health conditions . Alpha-Lipoic Acid: is another type of fatty acid that plays a key role in metabolism and energy production. Interestingly, it also functions as a potent anti-oxidant where it protects the body’s cells from inflammatory damage, while also reducing inflammation. This has been shown to be particularly protective against cancer, liver disease, and heart disease . Curcumin: is a key compound found in the spice Turmeric. It has been garnering a lot of attention within the health industry of late as it has been shown to have several impressive health benefits – one of which revolves around its ability to decrease chronic inflammation. The supplementation of curcumin has been shown to reduce the secretion of inflammatory cytokines, reducing the severity of the inflammatory process . Ginger: is a type of root that is often ground into powder and used in popular eastern dishes. Interestingly, ginger contains two key compounds (gingerol and zingerone) that have been shown to cause significant reductions in serious inflammation related to diabetes, cancer, and kidney damage . With all this, we have gone ahead and done all the hard work for you – doing the research and finding the best inflammation fighting supplements on the market today. Due to its high popularity, there are literally thousands of fish oil supplements on the market, some of which are MUCH better than others. 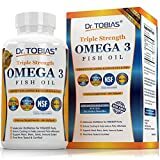 Dr Tobias triple strength fish oil is a great option that provides us with a large dose that is rapidly absorbed into the body. This is an excellent way to reduce inflammation throughout the body, causing large improvement in health and function as a result. Doctors best Alpha-Lipoic Acid is a fantastic choice as it provides us with a whopping 600mgs of Alpha Lipoic Acid per capsule. This makes it one of the most potent options on the market today. This potency ensures that it acts as a rapid ant inflammatory, in which it has the capacity to cause large improvement in health quickly and efficiently. Providing us with a huge 1500mg of curcumin per capsule, this is one of the most effective options on the market. 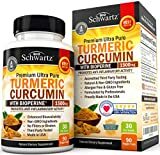 As an added bonus, this particular supplement has been combined with a compound called bioperine, which has shown to increase the absorption of curcumin significantly. This ensures that the vast majority of supplement makes it into the body, resulting in a large drop in inflammation. 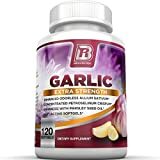 BRI are one of our favorite supplement producers. They have developed a sound reputation for producing high quality products and making them available at very competitive prices, making them a great choice for literally anyone. And this is quite apparent when we look at their garlic extract in particular. Coming in extra strength capsules, this supplement is one of the most easily absorbed on the market. Combine that with a relatively large sized dose, and you have a recipe for success. Although inflammation does have some benefit in acute situations, when prolonged it places the body under a heap of undue stress – greatly increasing our risk of disease and illness, while causing large reductions in both physical and mental function. Which is why it is quite fortunate that there are a number of supplements that have been shown to fight inflammation and cause large improvement in health as a result. These supplement interact with the body at a cellular level, decreasing the cause of inflammation while also promoting tissue healing and recovery. If you have had any experience with these supplements, we would love to hear about it – so please drop us a comment and we will get back to you ASAP.